From its inception in 2010, Hopscotch has been a signature event for the creative community of Raleigh, North Carolina. With more than 140 bands over 3 days, Hopscotch is known for adventurous lineups, memorable performances, and a fan-friendly atmosphere. From a large outdoor main stage in Raleigh City Plaza to intimate club shows, the festival features music in almost every genre imaginable—rock, hip-hop, metal, folk, electronic, experimental, and more—and its schedule highlights this diversity each year. Approximately 40% of the festival’s performers hail from in-state—a figure few, if any, nationally recognized music festivals can claim. Hopscotch Music Festival features local, national, and international bands in a variety of genres — rock, hip-hop, metal, dance, punk, alt-country, classical, noise, drone, folk and more. More than 130 acts play in multiple venues within a walkable footprint in downtown Raleigh, with artists performing on an outdoor main stage and in many local clubs. 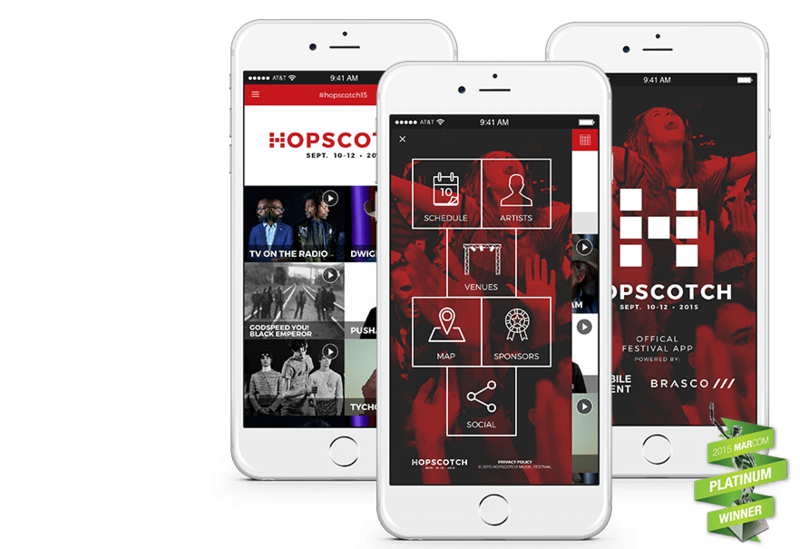 Because of the wide variety of performers and locations, Hopscotch needed to take advantage of technology and offer a mobile app to help festival goers navigate their favorite artists and venues. The goal was to design an app to enhance the overall festival experience.